Alexander Brizuela was born in California but started playing guitar when he moved to Argentina at the age of 14. 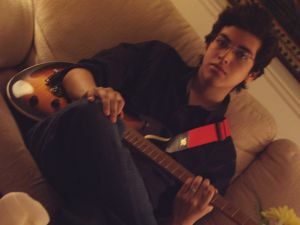 He and his brother won the "Vamos Las Bandas '08" contest, where they competed against more than 300 bands' original songs beating them all with their original music. He also won the same contest but in 2009, "Vamos Las Bandas '09" with his friend's band that he wrote a song for. Alex finds all types of music to be pleasurable for the ear. His tastes range from Classical music to Pop. He found the most powerful inspiration from Progressive music even though his first main inspirations were Blink 182 and Greenday and those bands were the reason he actually picked up the guitar. It wasn't until later, when he became inspired by more technically challenging music that he started to push his guitar and musical skills further. He is currently taking online guitar lessons with Tom Hess and writing the kind of music that allows him to speak from his heart. I'll show you how to master your guitar playing in rock guitar lessons online.